Home What Are the Benefits of Using Barbed Suture? Dr. Michael Nett answers questions from ICJR about barbed versus conventional suture material and offers tips for surgeons who want to adopt the use of barbed suture. 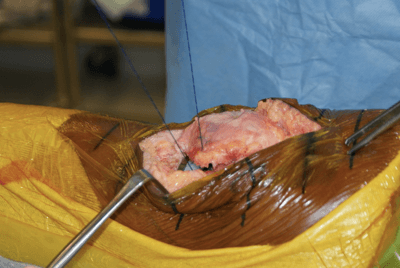 ICJR: What is barbed suture and what has been your clinical experience with using barbed suture to close the arthrotomy in your total knee arthroplasty patients? Michael P. Nett, MD: Barbed sutures, available in absorbable and non-absorbable forms, incorporate tiny barbs spaced evenly along the length of the suture. The principle of this knotless type of suture is to create an evenly distributed wound tension across the length of the suture line rather than at the knotted end. Bidirectional barbed suture (Quill, Surgical Specialties Corporation; Wyomissing, Pennsylvania) was first approved by the FDA in 2004. The barbs are arrayed helically around the suture and are facing in opposite directions, starting from the midpoint. 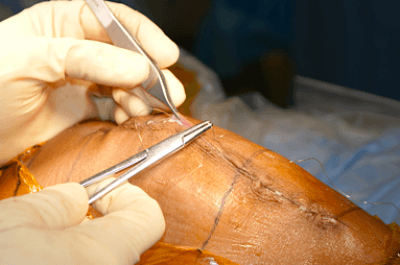 A recent meta-analysis assessed the clinical outcomes of barbed suture use in closure of total knee arthroplasty (TKA). Five randomized controlled trials were included, with sample sizes ranging from 178 to 416. Fix effect analysis showed that the use of barbed suture was associated with increased superficial infection rate and shorter estimated closure time. Questioning of the real effect of decreasing TKA wound closure by several minutes and difference in skin closure among the studies makes results confusing. Despite these controversies, we believe barbered suture may have benefits over conventional suture. Our practice has been using Quill suture since 2008. We use #2 polydioxanone bidirectional barbed suture for closure of the knee arthrotomy (Figure 1). The subcutaneous fat is then re-approximated with #0 polydionanone bidirectional barbed suture (Figure 2), and the subcuticular layer is closed with bidirectional barbed 3-0 monofilament suture (Figure 3). 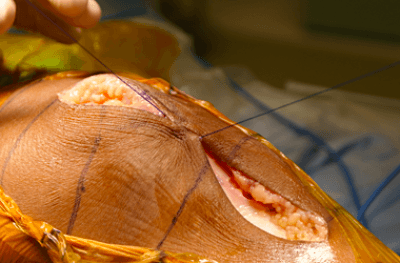 By using bidirectional barbed suture, we have seen an approximately 50% reduction in our TKA wound closure times, from an average of 22 minutes to 12 minutes. Figure 1. Arthrotomy closure with barber suture. Figure 2. Subcutaneous fat re-approximated with #0 polydionanone bidirectional barbed suture. Figure 3. Subcuticular layer is closed with bidirectional barbed 3-0 monofilament suture. 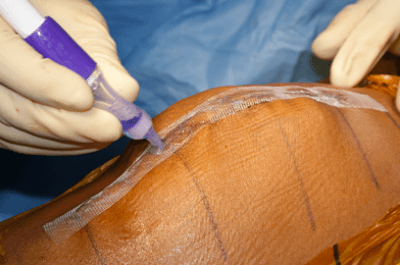 The incision is then reinforced with the Dermabond Prineo Skin Closure System (Ethicon; Somerville, New Jersey) (Figure 4), a topical skin adhesive and a flexible self-adhesive mesh. The combined use of barbed suture and the liquid adhesive, in our experience, has reduced any immediate wound drainage or leakage. 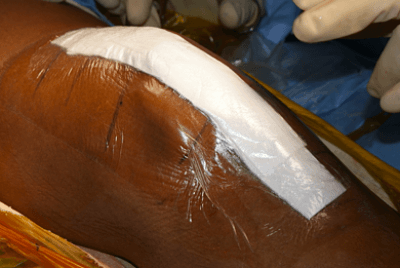 This has allowed for a simple approach to the surgical dressing, with a single layer of non-adherent gauze and a transparent film (Tegaderm, 3M; St. Paul, Minnesota) (Figure 5). Figure 4. Dermabond Prineo Skin Closure System is a topical skin adhesive and a flexible self-adhesive mesh. Figure 5. Surgical dressing with a single layer of non-adherent gauze and a transparent film. For postoperative care, the initial surgical dressing is changed on POD2 for visual inspection of the wound. The Prineo dressing is left in place. The dressing is replaced with the same non-adherent gauze and transparent film. The dressing is left in place until POD10 and then discarded and the wound is left open to air. The Prineo dressing is peeled from the skin at the first postoperative visit at 3 weeks after surgery. We utilize an incisional negative pressure wound therapy (NPWT) system (Prevena Incision Management System, KCI USA, Inc.; San Antonio, Texas) in our high-risk patients. Pre-sized and customizable options are available, depending on incision length and shape. Our practice has not established a strict protocol, but morbid obesity (body mass index > 50), revision surgery, reimplantation surgery, and surgery for active infection are our current indications for use. 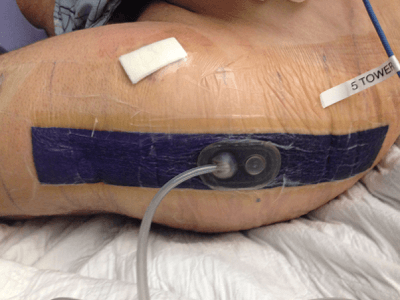 The incisional NPWT dressing is left in place for 7 days postoperatively and then discarded (Figure 6). Figure 6. A customizable incisional negative pressure wound therapy systems is in place following resection arthroplasty of an infected total joint. ICJR: What are the key points surgeons should keep in mind when using barbed sutures? Dr. Nett: Barbed suture must be handled carefully. The biggest mistake that we have seen is mishandling of the suture by OR personnel, which could inadvertently bend the barbs of the suture. If the barbs are damaged, the suture should be discarded. Additionally, the surgeon must be careful not to over advance the suture past the midway point or transition zone as this, too, will bend the barbs of the suture making them ineffective (Figure 7). Figure 7. Quill suture midpoint with transitional zone demonstrating the reversal of the direction of the barbs. I frequently use several interrupted sutures to re-approximate and align the arthrotomy closure. I find this helpful in establishing appropriate patellar tracking before running the arthrotomy closure with the barbed suture. This may be specifically helpful in cases in which the medial tissues are being advanced in an effort to realign the extensor mechanism. Michael Nett, MD, is an attending surgeon and Assistant Chairman of the Department of Orthopedics at Southside Hospital, Northwell Health System, Bayshore, New York. He is also an Associate Professor at Hofstra University, Hempstead, New York. Dr. Nett has no disclosures relevant to this article. Patel, R.M., et al., Wound complications in joint arthroplasty: comparing traditional and modern methods of skin closure. Orthopedics, 2012. 35(5): p. e641-6. Nett, M., et al., Water-tight knee arthrotomy closure: comparison of a novel single bidirectional barbed self-retaining running suture versus conventional interrupted sutures. The journal of knee surgery, 2011. 24(1): p. 55-9. Vakil, J.J., et al., Knee arthrotomy repair with a continuous barbed suture: a biomechanical study. J Arthroplasty, 2011. 26(5): p. 710-3. Meena, S., et al., Barbed versus standard sutures in total knee arthroplasty: a meta-analysis. Eur J Orthop Surg Traumatol, 2015. 25(6): p. 1105-10.